Driving is a lot of fun and with proper training, it can be very rewarding. If you’ve never driven a horse, by all means, take driving lessons before you ever purchase a driving horse! Here are some things to look for when searching for a horse that is already trained to pull a cart. When you arrive at the seller’s facility if the horse is already hitched this could be a sign there are problems. Ask the owner to unhitch the horse completely and start from the beginning. If the owner refuses to do this then it would be best to walk away. You will want to see how the horse acts during the harnessing process and as it is being hitched to the cart. During the harnessing process if the horse dances around this could be a sign of nervousness or it may be that the horse is very green to being harnessed. When being hitched to the cart notice how the horse acts when the cart is being put on. Are they dancing around, is their head raised high, are their eyes getting big? All of these could be signs the horse is nervous about the cart. You want to find a horse that is quiet and calm while being harnessed and hitched to the cart. Have the owner take the horse through its paces before you get in the cart and observe how the horse acts. Does the horse stand quietly while the driver is getting in the cart? Do they wait for a command before walking forward? Does the horse walk quietly or are they wanting to prance around? When asked to trot do they bolt into the trot or calmly go into a trot? When asked to stop does the horse throw it’s head up and resist the bit? Does it take several steps with the horse resisting to get them to stop? Do they have to run the horse into something to get it to stop? All of these are signs of a horse that is in fear or they have not been properly trained which is dangerous. A horse hitched to a cart is basically pulling a weapon. After the owner takes the horse through its paces if the horse is calm and quiet then, by all means, get in the cart with the owner and go for a drive. If you’ve had some experience with driving then take the reins yourself and see how the horse responds to you. If you are new to driving take someone with you that has a lot of experience with driving. An experienced driver will be able to tell you if the harness and cart properly fit the horse. An ill-fitted harness or cart can be a setup for a dangerous situation. Have fun and stay safe. I no longer offer training for driving. 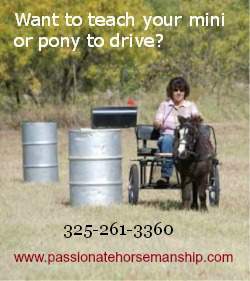 If your interested in teaching your pony or miniature horse how to pull a cart for driving I highly recommend Bobbie Ferraro of Peace Pipe Ranch. We have had minis now for 17 months. Beginners completely!! just starting to train mini to drive. Any suggestions would be great. I have two 3 year old mini geldings, and one 8 month old mini to be gelding. We keep little one separate but share fencing for closest in hopes of using him as a therapy mini. He is a little spoiled and at times acts like a sassy two year old child, by doing a little kick to the side when told no. Working on displine. Would love any information. Thank yoy in advance. How would you start a mini horse to pull a cart? First make sure they have a great foundation. They need to understand backing, turning, stopping etc. They also need to understand voice commands. When both of these are solid you start out walking the mini on one side and pulling the cart on the other side. If you’re interested a good friend of mine had some fantastic DVD’s that will teach you how. Let me know.